Circuit de Monaco. Monte Carlo. The ultimate race in the Formula One calendar. 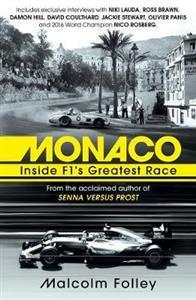 When you think of Formula One, you think of Monaco. Once a year, yachts jam the harbour, celebrities fill the stands and luxury sports cars litter the streets as of thousands of people gather from across the world to watch the greatest, and one of the oldest, races in motorsport. Monaco is glamorous, prestigious and seductive. But for the drivers, it is the most demanding race of the year. The narrow streets, tight corners and sharp elevations make it the ultimate test of driving skill. It is physically draining and mentally exhausting. Proposed today, the race would not exist but it remains the jewel in the crown for every Formula One driver. There is simply no other race like it. Win at Monaco and your name is etched in history. You will join the likes of Graham Hill, Jackie Stewart, Ayrton Senna, Alain Prost, Michael Schumacher and Lewis Hamilton. With exclusive interviews and insight from drivers and a wealth of F1 insiders, award-winning sportswriter Malcolm Folley goes behind the scenes to discover what it's really like to drive and live and breathe this iconic circuit. He reveals along the way a unique and definitive portrait of the circuit, and recreates in thrilling detail its most extraordinary weekend, when only three cars finished.